Efforts to guard the river Yamuna in Delhi against industrial pollution received a major blow recently. The Delhi State Industrial Development Corporation (dsidc) missed the October 15, 2004, deadline proposed by the Supreme Court Monitoring Committee (scmc) on hazardous waste to make 10 Common Effluent Treatment Plants (cetps) fully operational. While the plants have been constructed, they can hardly be called functional. They are grossly underutilised and have no system to use the treated effluents and manage the hazardous sludge they generate. The industries also missed a deadline on the same date. cetp societies, comprising industries, were required to pay their dues of Rs 73.81 crore to dsidc to take charge of the existing cetps. But they did not do so. dsidc is running the existing plants at present. dsidc managing director Jalaj Srivastava claims that the deadline wasn't binding: "The Supreme Court (sc) is yet to issue its orders on the scmc proposal." Referring to an earlier sc order to construct 15 cetps in the capital (see box: It so happened), dsidc chief engineer R K Gupta says another two cetps are in the process of construction and three are yet to be tendered. But the question is how useful these would be if they are infested with the same flaws that plague the existing cetps. Improper functioning R K Gupta says the existing cetps operate at a mere 25-50 per cent capacity. "The capital cost of cetps which are complete and underutilised is Rs 132 crore, roughly Rs 1 crore per million litres per day," says the Environment Pollution (Prevention and Control) Authority for National Capital Region (epca) in its report to sc. epca was entrusted with monitoring the implementation of the 1996 sc order. Lack of conveyance to carry wastewater is believed to be a major cause of the underutilisation. 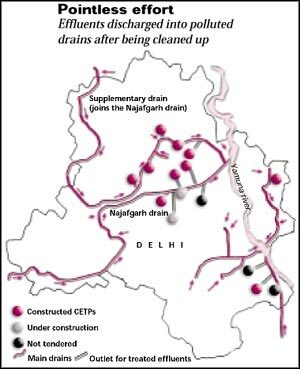 "There is no specific conveyance system; industrial effluents mix with domestic sewage and reach the cetps through open drains," says Rajpal Gupta, chairman, Wazirpur Industries Pollution Control Company, a cetp society. cetp societies also allege that the plants are not designed to treat mixtures of domestic and industrial wastewater. Citing such technical inefficiency, they refuse to pay their dues to dsidc to take charge of the plants. As per the Delhi cetp Society Act, 2000, the plants can be handed over to them after dsidc's trial run and clearance from the Delhi Pollution Control Committee (dpcc). Four of the 10 cetps have dpcc clearance. But Rajpal Gupta says the societies would take them over only "if dsidc resolves the technical issues and runs them for three months at full capacity". R K Gupta counters the allegation of technical inefficiency by highlighting the quality of the treated effluent: "Except in the Wazirpur cetp, the treated effluent has a biochemical oxygen demand (bod) of five milligrammes per litre, much lower than the prescribed bod for disposal into rivers." But a dpcc official says the figure might not be reliable since cetps are underutilised. There are other contentious issues too. Experts say cetp societies need capacity building to run the plants properly and a monitoring system needs to be put in place. Bad management The cetps involve a capital cost of Rs 256 crore and a monthly operating cost of Rs 25 crore. But the treated effluent is discharged mindlessly into polluted drains (See map: Pointless effort). The dsidc is also clueless about how to manage the hazardous sludge generated during the treatment. It is stored in sludge collection dumps at the plants. But experts say it must be stabilised/digested before being sent to engineered landfills. epca has urged sc to resolve the problems related to cetps in a time-bound manner. Even if this unlikely feat is achieved, experts say the long-term strategy should be promoting clean production technology.